Please subscribe to his channel and LIKE his videos to show your support for his work. Also, use the buttons below to share this with your friends! 70% OF THE PROCEEDS FROM THE NEW PACKAGE PURCHASED WITH THE LINKS BELOW GO TO ERIC DOLLARD & EPD LABORATORIES, INC.
IT’S ONLY $7 SO GET A COPY TO HELP COVER ERIC’S TRAVEL COSTS TO DO THIS PRESENTATION! These AM radio waves are electromagnetic in nature and are known as Transverse Waves. These waves conform to the Inverse Square Law, which means that energy is diminished by the square of the distance. The further the waves are from the radio station, the less energy there is at the receiving end. So, if you wanted to power something significant at the receiving end, this is not the route you want to take. Nikola Tesla figured out a more fruitful path many years ago and the concept is very simple. Every AM radio station not only transmits Transverse Waves through the air, it transmits Longitudinal Waves through the Earth! What is significant about this ground transmission is that it does not conform to the Inverse Square Law. transmission has almost no loss between the transmitter and receiver. Therefore, if you wanted to power something significant from an AM transmission, this IS the route you want to take. In addition to the ground transmission being nearly lossless, it is also faster than the electromagnetic waves sent through the air. The electromagnetic waves are moving just about at light speed so if the longitudinal ground transmission gets to the receiving end faster, what does that tell you? It is not subject to light speed limitations. It is not faster than the speed of light, it is instantaneous for all practical purposes and is therefore Extraluminal. To experience exactly what Tesla had his hands on, which obviously overturn the conventional apple cart, what you need is not just any Crystal Radio but a Tesla type Crystal Radio using a Tesla Resonant Transformer. It is similar to a regular Crystal Radio, but it does not have an antenna – that is all build into the coil and it connects to the Earth. It is also actually very simple in principle and you can figure out how to build your own real Tesla Resonant Transformer with nothing more than junior high school basic algebra. 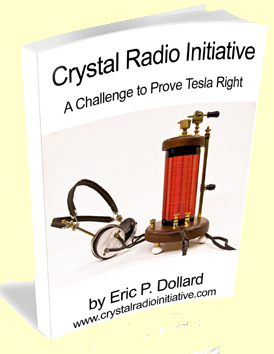 Months ago, we gave out a free video presentation by Eric Dollard called the Crystal Radio Initiative along with a free 300 page book with all the notes, schematics and discussions on this open source project – that book and video are now part of a new package that has a brand new presentation. Recently, Eric came to Spokane, Washington to work on some projects and to give a presentation teaching anyone how to calculate a real Tesla Resonant Transformer. And, you’re going to learn it by the most authoritative expert in the world on the subject. 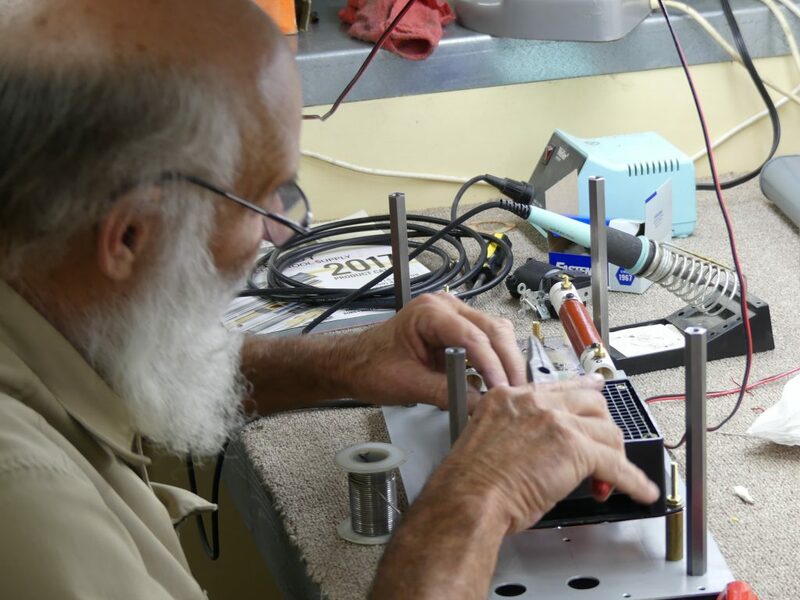 It can be used for this Tesla Crystal Radio project, a Cosmic Induction Generator (another one of Eric’s projects) or a multitude of other projects relating to the Tesla sciences. With one coil or a set of coils, you can do countless experiments just like what Eric has demonstrated over the last several decades.